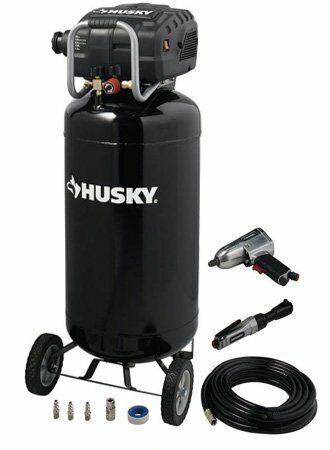 If your job is to do high-volume of light and heavy duty tasks but your air compressor does not have enough capacity to do so, maybe it’s time to switch to another model that has a bigger tank. Husky 60 gal. Stationary Electric Air Compressor has a large capacity. 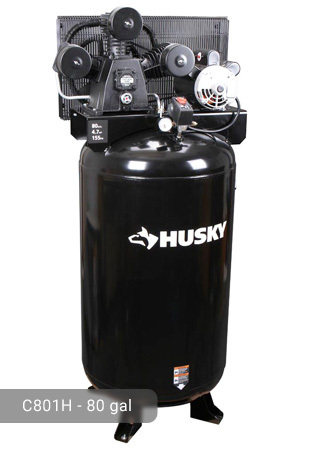 It can accommodate 60 gallons of compressed air which allows for longer run times of air tools such as ratchets, impacts, spray guns, hammers, and many more. The tank is ASME certified so you are guaranteed to have a reservoir that has met the minimum requirements for safety and efficiency. 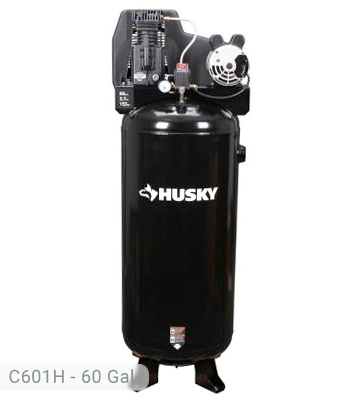 Husky 60 gallon air compressor C601H also has a heavy duty induction motor that has a power output of 3.7 horsepower. This output can definitely maximize the performance of your pneumatic tools. The pump (two cylinder type) can deliver 13.4 CFM of air at 40 psi and 11.5 CFM at 90 psi. The maximum pressure is at 155 psi. 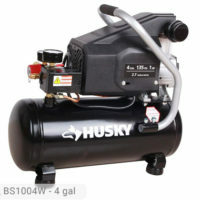 The pump and the motor ensures the optimum efficiency and reliability of the Husky air compressor. Before coming up with the final air output, the air undergoes single-stage compression which ensures that the compressed air is of high-quality and is free from dirt and contaminants. Because of this and the huge tank of the air compressor, it can easily perform the following tasks: drilling, hobby nailing, roof nailing, spraying, surface preparation, framing nailing, grinding, HVLP painting, and many more. Both garage and industrial applications can be done using the unit. The pump of this model, made of cast iron, is oil-lubricated so it is expected to be more durable than oil-free air compressors with the same tank capacity. However, more maintenance activities are required. The package is already shipped with a synthetic oil. This oil works ideally for the air compressor providing extended working life. The pump also features a pressure gauge which allows you to view the level of air pressure while you are working. It is also equipped with an on and off switch that helps in the regulation of just the right amount of pressure. 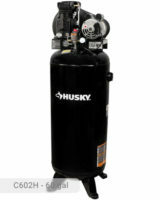 Husky 60 gallon air compressor weighs 208 lbs. so it is better left stationary. Do not attempt to move it from one place to another frequently because it has no wheels and handle. If you really need to move it, make sure to drain the oil first to avoid leaks. The tank is oriented vertically and is not as slim as the other models. It operates with noise that can be tolerated (up to 84 decibels). To start running the tool, you would need a 230-volt electrical power source. 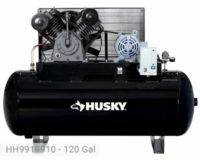 Husky 60 gal Stationary Electric Air Compressor is not too small nor too big in terms of the tank capacity. For many professionals, this is the perfect unit to use because it can perform almost all types of applications. Although it is not portable, you can still rely on it whenever you need a supply of compressed air because of its efficient and great performance. If you already own Husky C601H model or just want to buy it, feel free to share your review or ask a question through the form below. 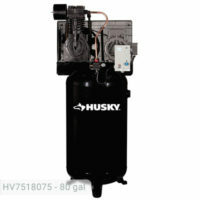 We have a Husky 60 Gal Air Compressor, C601H that we have had as back-up and is now being put back to work. We are in need of the manual for this compressor. If you could supply me with a pdf copy it would be greatly appreciated.